ROSMUC: Beaches, Great walks, Totally unspoilt country side, Gaelic Speaking area, Pearse cultural centre, Closer to Galway City. The best way to find Rosmuc is to take the N59 from Galway. Turn left at Maam cross and continue on past Screebe. Pass Screebe this will bring you into Rosmuc village with football pitch on your left and church on your right.The Rosmuc area is a well kept Secret which needs to be discovered! There is also local shop and pub. 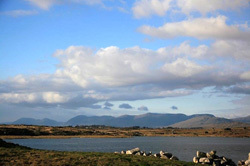 Ionad Culturtha is located here in the heart of the Connemara Gaeltacht. It was here that Patrick Pearse, writer, educator and leader of the 1916 rising built a cottage for himself on the shores of Lough Oiriulach in 1909. The visitor centre houses a fascinating interactive exhibition dealing with Pearses Legacy, exploring things that drew Pearse to Connemara and the areas unique landscape, history and ancient gaelic culture and language which is still alive in the area today. Visitors can take a short stroll across the bog to visit Pearse cottage left just as it was when Patrick himself left the cottage for the final time in 1915.Fishing, walking and wildlife spotting comes to mind, and it is a place for tranquil afternoons drifting afloat casting a line trying to catch the odd Salmon or Seatrout, a brisk morning walk or photographing some of the many birds and animals that frequent the area. The countryside still boasts lots of old traditional type cottages made cosy over time, and features such as the Bertrachboy bay lazily flowing in and out revealing seals and dolphins, shell fish and sea weed. Cashel House Hotel beckoning you for afternoon tea and a stroll around its vast and beautiful gardens. The odd Connemara pony lazing in the sun slashing the flies with his tail and wondering what to do next. 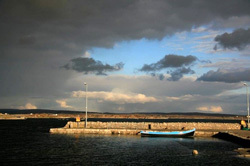 Rosmuck or Ros Muc lies in one of the strongest Irish speaking areas in the country. Padraig Pierce member of the 1916 Easter Rising spent some of his leisure time in this area and his cottage can be visited today. 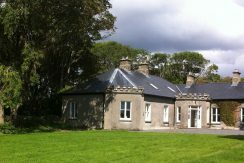 The cottage, burned down during the troubles, has been restored as a national monument and is open to visitors daily, June to September.